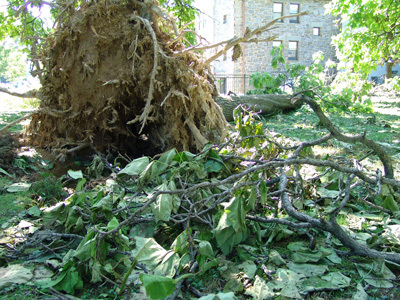 Hurricane Irene’s fury delivered 6 inches of rain and wind gusts reaching 52 mph, but no heartbreaks. 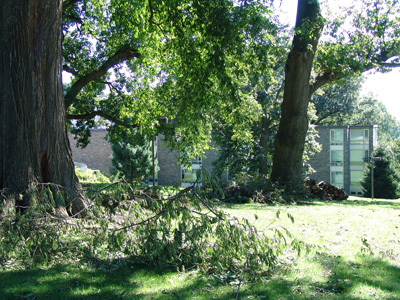 While we lost a large Catalpa speciosa in the Catalpa Collection, the rest of the campus suffered minor damage with broken branches and scattered leaves. 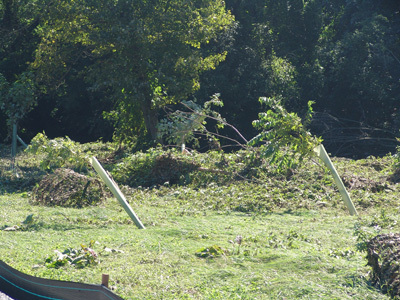 The Crum Creek flowed through its flood plain including Rogers Grove and the newly established riparian forest buffer, cresting at the feet of the James R. Frorer Holly Collection. The hurricane and major thunderstorms that have recently passed through the area have given our stormwater management strategies quite a workout. Check out the video below to see how stormwater features can be an attractive feature in your garden. This was filmed after a 1.95 inch rain event this August. Interesting video. I would love to have waterfall stairs myself. The waterfall stairs are a favorite of mine as well. I love the gentle trickling sound they create in the garden. Really great video showing creative and beautiful ways to manage storm water runoff!